North Tampa Behavioral Health facility in Wesley Chapel, Florida, owned by Acadia Healthcare. Acadia, which operates a network of nearly 600 behavioral health-care facilities with approximately 17,800 beds in 40 states, has been approached by private equity firms by KKR and TPG Global, among others, according to Reuters, citing people familiar with the situation. Reuters said no deal was certain. Shares of Acadia rose by more than 9 percent in morning trading Thursday. 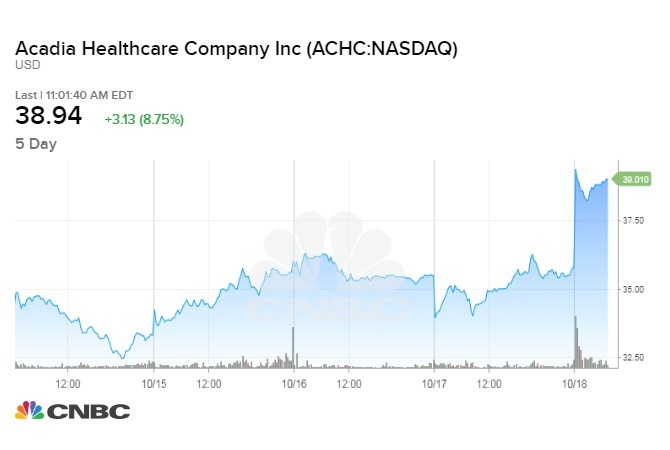 Acadia, which has a market cap of $3.4 billion, has seen its shares rise more than 18 percent so far this year. However its shares have fallen 8 percent over the last 12 months. Private equity firms have been flocking to health-care companies recently, consolidating the market. KKR completed a multibillion dollar deal earlier this month to acquire Envision Healthcare, the nation’s largest provider of emergency room doctors. Acadia, KKR and TPG Global did not immediately respond to CNBC’s request for comment.